A special thank you to Anjou Gerhardt for these photos and her father's journal entries. This is an amazing addition to the site. 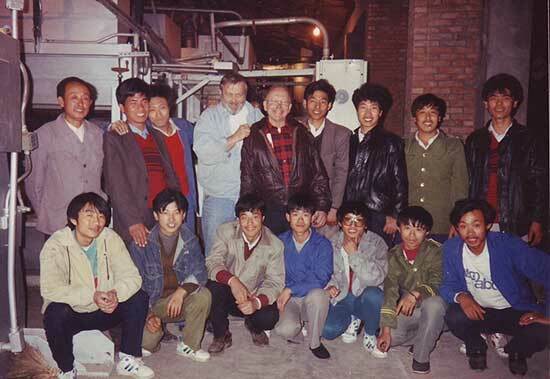 Anjou's father, John Healy, was a factory foreman at Georgetown, then Blue Island (1989), then Toccoa (1997). 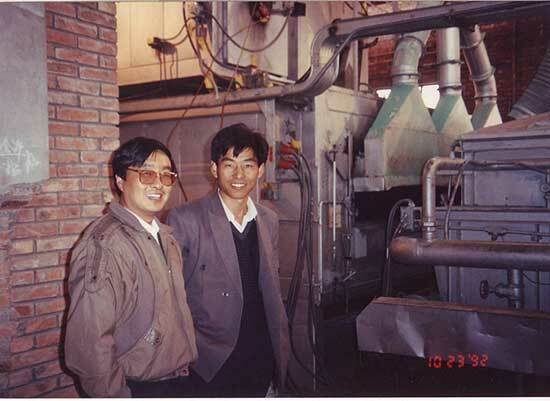 In Oct. 1992, Sept. 1994, and Jan. 1996 he was sent to China- Hebei Province, Huang Hua City, to assist with the G&B wire manufacturing equipment...often alone. 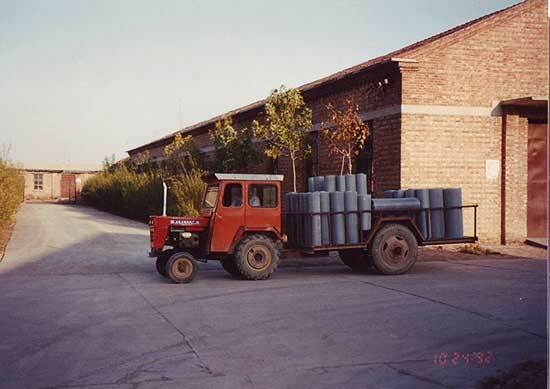 Below are photos from his 1992 trip. John Healy is the tall bearded man and it is believed that the man in the plaid shirt, wearing glasses is Carl Brooks. 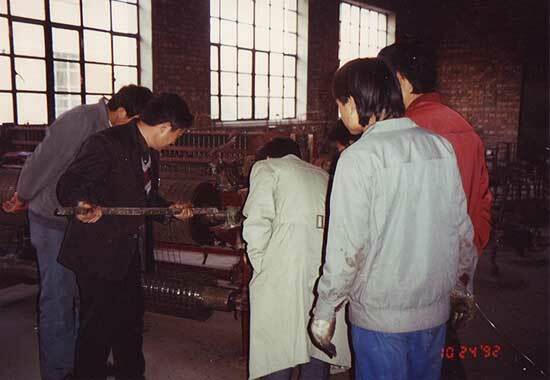 In the photo above they are launching the new machine. 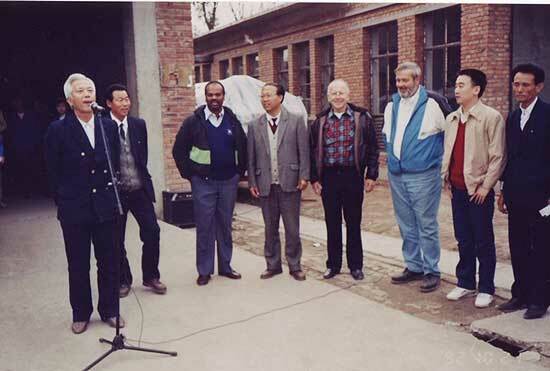 The gentleman in a blue jacket with a green stripe (3rd from left) is thought to be Jay Naidu/Nadu. It is believed that he was one of the main orchestrators of the trip. 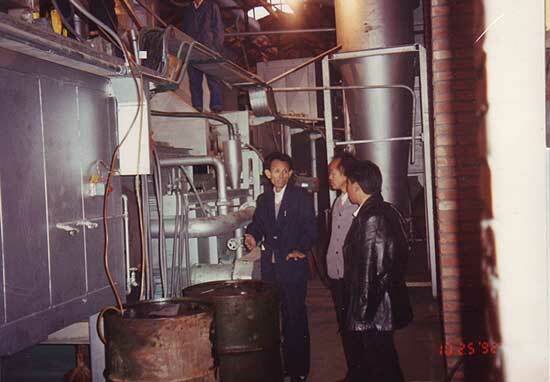 Factory location: Hebei Province, Huang Hua City. 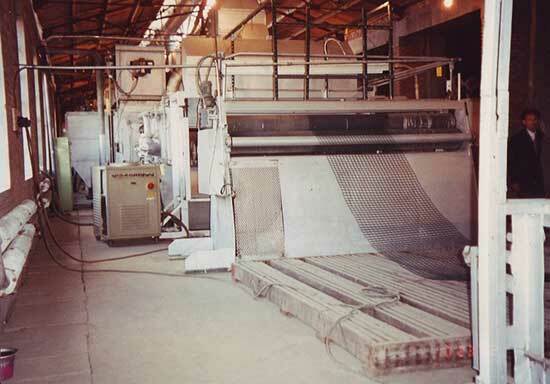 Factory name: The factory may have been called OMSA. There is a reference to a tour that they took of another factory where he writes "they coat them almost the same as OMSA but instead of [giving] them powder they hand dip them and then cure them." 1. No. 1 Curing oven kept kicking off. There was an issue with the burner. It would run too hot. When it would reach the temp limit, the red light would come on but the burner would stay on high fire. 2. Issues with both #1 and #2 burners. 3. The two preheat ovens shut off and wouldn't restart. 4. There are pull rollers and powder beds. Trouble with pull rollers. Water quench motor. 5. Once working - started putting powder in bed. Still problems with #2 curing oven burners which seems to be the worst. 6. Seems like things were reversed and that is why they weren't working. "Found out what was wrong with powder bed. It was reversed like everything else." 8. "Nadu/Naidu and C. Brooks will be here tues 10-21-92. Hopefully everything will go very good. I have always heard 'like a Chinese fire drill' well now I know what they mean." Burners still not working right. The Chinese have made banner to welcome Naidu and Carl. 9. "Well Carl and Jay arrived finally and the machine ran very well. Carl and Jay were very impressed...From now until the 27th I will be working with Carl to get the machine working real good. Right at the end of the run we lost a splice but Carl and Jay did not see it. I will have to thank all the workers tomorrow for making this a success." 10. The Chinese did not seem anxious to let them leave. They had to extend their stay due to issues with the machine. "Mr. Che is nervous. Still not sure when I am leaving. They told me I did not have to [stay in China]. They talked to Mr. Who and I guess he said it was OK. I wrote on paper what was wrong with machine. If I stay I don't really know what could be done until burners are fixed." 11. Everyone went out with him the night before he left and they all came by the hotel the morning he left to say goodbye. Have pictures you'd like to include? Email them to bcolley@colleyweb.com or call me at 860-364-7475, I can scan the images if you'd like and get them right back to you in less than a week. Contrary to public perception the History of Redding web site is not a business, historical society or non-profit organization...It's one person working to promote the history of his hometown and surrounding areas. All costs are out-of-pocket so donations and/or sponsorships will allow me to dedicate more time and effort to research and updates.